Refrigerant leaks are one of the leading causes of air conditioner mechanical failure. If your central air unit is failing, do not make the mistake of recharging your system without first having the leak located and repaired. The price of refrigerants is high, their release into the environment can be harmful, and if several recharges are completed in succession, the oil in your compressor will be depleted. Compressor damage is a major issue, and can be expensive to repair. Contact Climatrol for prompt diagnosis and repair of your residential or commercial central air conditioner. We are a licensed HVAC contractor and have been serving residents in Clarksburg and the surrounding area since 1969. Why is My AC Refrigerant Leaking and How Can I Fix It? Although locating and repairing the source of your leak may cost more than pouring in new refrigerant, repair is the only sensible option. There are many causes for refrigerant system leaks, and it is helpful to learn why your system is leaking. Some common causes include vibrations that cause components to come loose over time, weakened connections, punctures within the system, poor quality installation, age, inability of the tubing to handle the high pressure of the system, and defects in manufacturing. The copper in your system is subject to corrosion, as well. If you have leaks in multiple locations as a result of formicary corrosion from pollutants, replacement of the entire coil may be your best option. Once corrosion from off-gassing and airborne pollutants becomes severe, the process cannot be halted. 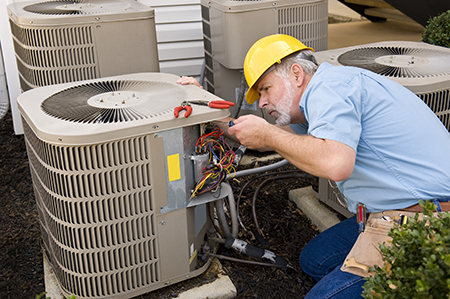 Contact our skilled technicians for a consultation to discover the best method for fixing your air conditioner and returning it to proper operating condition. Contact Climatrol to schedule regular maintenance and inspections to avoid major issues before they develop. If you require a tune-up, repair, or refrigerant service, our team is available to provide the prompt, professional service required to restore your system to efficient and effective operation. In some cases, system replacement may be the most cost-effective decision. Rest assured that we will recommend the best option for you and your energy budget. For a free quote or service, call: (304) 623-0606.